Travis Hauck lives in Nelson and is arguably the most accomplished XC racer in this year’s host region for ST6. Having previously landed on the TransRockies Challenge podium and possessing a vast knowledge of the trails in the Nelson area, Travis has been instrumental in helping shape this year’s Singletrack 6. Here he shares his reflections after a recent reconnaissance of Stage 5 with renowned MTB photographer, John Gibson. Stage 5 starts at 9 a.m. on the shores of Kootenay Lake in the village of Kaslo, B.C. The 40 km. stage has 2000 meters of climbing and is a mixed bag of terrain. 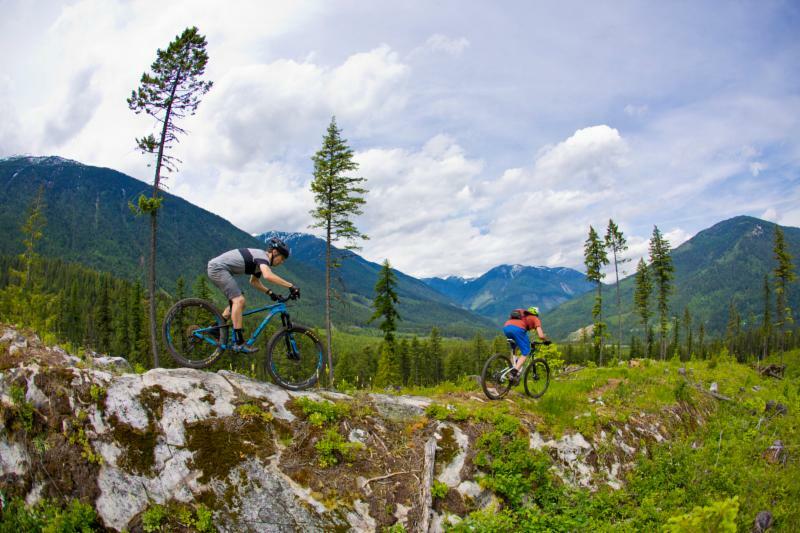 Riders will make their way through the streets of Kaslo and then onto the longest climb of the day, a paved 4 km, steep road climb and then onto another steep 4.5 km. forestry road climbing on the Branch 7 road. After a 500 meter climb, we finally top out and descend part of a trail called No Brakes and then join onto the West Access Trail for a mix of roots and rolling single track with a few narrow sections where the trail follows steep hillsides. A few steep switchback climbs lead to a viewpoint where the fun, flowing singletrack descends for about 4 km. to the Wagon Road. There are a few technical sections at the start of this descent and the first few switchbacks have some roots, which could be dangerous if it’s raining on race day. Chances are it will be dry and hot so be ready for some fast, loose, technical, rooty and rocky riding. Kaslo Trail Builder Steve Doucet and Travis take in the views. It has been years since my freeride days but I’ll never forget the rush of riding the wooden labyrinth of skinny log rides 10-20ft. off the forest floor. I’m excited that the ST6 will be using the newly rerouted and rebuilt single track to take us alongside this museum of stunts and give the racers the feel of the old Kootenay freeride culture. Kaslo racer and trail builder Steve Doucet gave us the skinny on Mr. Skinny. “The newly built Mr. Skinny singletrack trail has some steep and technical sections. This trail parallels and crosses the old Mr. Skinny trail which was built in the old school stunt days as an extension of the Monster downhill trail, with long skinny log rides and drops. Many of the old stunts are visible trailside as the new trail weaves through the graveyard or broken bridges and stunts. The new trail doesn’t have any stunts, only a couple of wide bridges for creek crossings. Then 3km. of flat highway riding leads to the second half of the course, which is mostly forested singletrack”. The timed descent starts about ¾ of the way into stage 5. 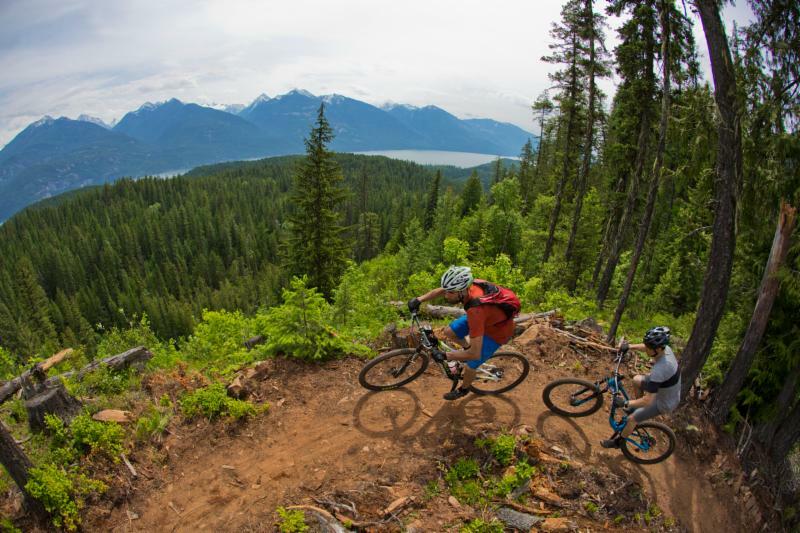 We climb up to the timed descent on a new trail called Strawberry Ridge, which was built by local Jason Remple and is an awesome addition to the trail network south of Kaslo. The trail tops out on an old, logging cutblock and offers some great views of the Purcell Mountains to the east and the thick forest of the Goat Range to the west. The timed descent has some pretty fresh dirt and if it’s dry it should be loose and loamy, but if it’s wet look out for the hidden roots and be aware of some tight corners and tight trees. Stage 5 will be good for the soul. Generally riders struggle on day 4 of ST6 but get a second wind to finish the event strong. If you are not feeling strong during this stage the adrenaline of being out in the middle of nowhere might help you hustle to the finish line. Stage 5 will have similar soil to stage 4 in Nelson but the less impacted trails of Kaslo should make for quite enjoyable loam shredding. This Kaslo stage will prepare racers vertically and technically for the final day of this six-day race in Nelson. The last 3 stages of ST6 will be long and grueling. Get a good night sleep before Stage 6 so you can giver on the final and most challenging day of the event and then party like a rock star in downtown Nelson after she’s all done.